China’s Unicom, the mobile operator offering iPhone 4, said today that pre-orders for Apple’s iPhone 4 in China have exceeded 2,00,000 units ever since the iPhone was officially released in China last Saturday. 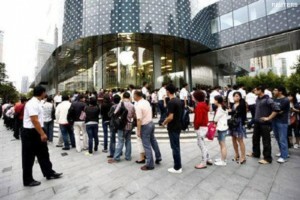 Unicom also reported that it has stopped taking pre-orders for the iPhone 4 due to high demand and availability issues. Unicom also said that about 60,000 customers already received their phones. These numbers are much higher in comparison to the iPhone 3Gs sales which took 6 weeks to pass the 1,00,000 mark. The iPhone 4 is being offered in China through Unicom on a two-year mobile subscription contract. The phone is also available through the Apple retail stores in China. China Unicom is the exclusive distributor of the iPhone 4. Previous The Bra that Protects You from a Biological Attack!